That’s right, I’m going to defend Paper Mario Color Splash. I want to try and focus on the positives and what could make this game fun, if people are willing to give it a try. Just a disclaimer, I don’t know everything about the game. I do want to play it and I’m trying to avoid spoilers. This is just a general overview with non spoiler-y reasons for why it might not be as bad as everyone says. Thank you for understanding. 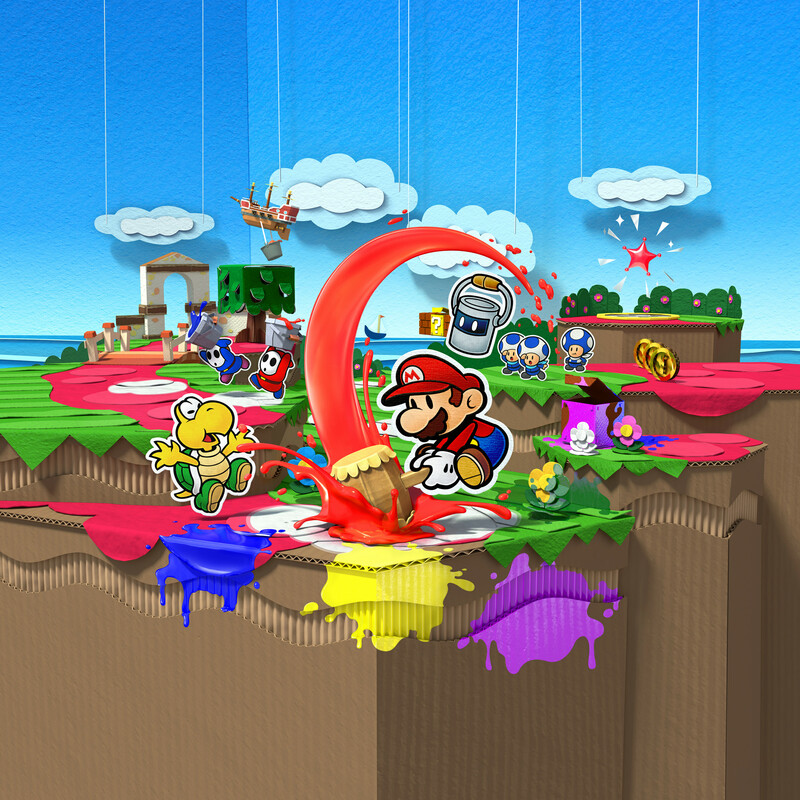 Sticker Star got rid of the rpg elements the series was known for, brought in a new battle system using stickers to attack, and focuses much more on the fact that everything is made of paper. This angered the fans of the original Paper Mario games and hoped that in the future, Nintendo would learn their lesson and make a more traditional Paper Mario game. When Color Splash was revealed, it was down voted so much it was insane. People complained about it being Sticker Star 2, and I won’t lie, I was mad too. However, I decided to keep an open mind about the game. I was still angered about the direction of the series, but there’s nothing we can do. This game is an action-adventure. I’m sure you’re aware that, at Nintendo, we also have another series called the Mario & Luigi RPG series and so since we already have that established Mario & Luigi RPG series, in order to differentiate these two series that we have running concurrently, we’ve tried to focus more on the non-RPG elements for the Paper Mario games. In terms of what we focus on for the Paper Mario series, we focus on puzzle-solving [and] humor. So they’re replacing the rpg elements and keeping it for the Mario and Luigi series. That’s not that big of a deal. The Mario and Luigi series are great games, with great stories, and even has humor that’s even better than Paper Mario, in my opinion anyway, but I digress. It’ll be like exploring the worlds of the Paper Mario games, but you won’t level up or anything like that. Hopefully it’ll scrap the over world that Sticker Star had in favor of going back to free roam exploration because nothing slows down the pace of a game like choosing a location playing through one level and then going to the next point on the map. It’s works in the other Mario games, but not for a game like this. If they want Paper Mario to be action/adventure, then they can’t use the level select. It just takes you out of the world. Finally, there’s the characters. People are mad because they don’t have interesting characters and they’re all generic Toads. Let’s take a step back again, and let’s not think of this as an rpg, but a standard 3D Mario game. Did Super Mario 64 have interesting characters? No. It introduced Mips, the yellow rabbit, and I think that was the first appearance of Klepto the Condor. Alright, this might be a bad comparison though because it was an early game. Let’s go with Super Mario Galaxy and Super Mario Galaxy 2. Galaxy 1 introduced Rosalina, who was the only new character. Luma’s were new, but they were more of a species than characters. They were also generic like Toads. It also introduced Honey Queen, who only showed up in a few missions. Galaxy 2 had Lubba, the giant purple Luma and a whole bunch of new species who were all pretty generic. Honey Queen also made an appearance, but again, it was small. Also Captain Toad was formally introduced in this game… I guess he could be considered a major character seeing as he got his own game. Besides the rpg games, Mario hasn’t been a series to introduce many interesting characters and since Sticker Star and Color Splash are no longer considered rpgs, they actually fit in nicely in the way of having uninteresting characters. However, Nintendo has released a couple of videos showing off the Rescue V Squad. Rescue “five” Squad? I’m not sure, but The Rescue V Squad are a group of 5 Toads, who all have different colors and matching outfits. They’re a bit like the Axem Rangers from Super Mario RPG or the Koopa Bros. from the original Paper Mario. Not only are they interesting, but in the trailers revealing them, they make some pretty funny 4th wall breaking jokes and as shown in game, they’re really helpful in Mario’s adventure. There’s also two more videos on the Rescue V Squad to check out too, if you’re interested, but they won’t be posted here. 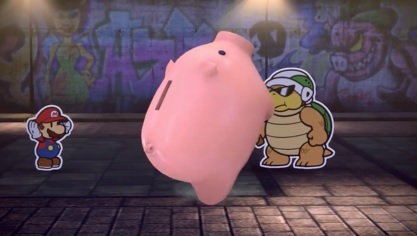 The only other character, that I’ve seen, who isn’t a generic Toad is a floating paint can named Huey, who from what I’ve seen, gives Mario the ability to make colors come from his hammer. Speaking of which, the story is at least interesting. If you asked me what the story for Sticker Star was, I’d look at you dead in the eye and say, “I have no idea” because it wasn’t really memorable. For this game, someone or something, is going around and taking color away from everything on Prism Island. It has a basic, easy to understand premise and could lead to something interesting… or another Bowser boss fight. 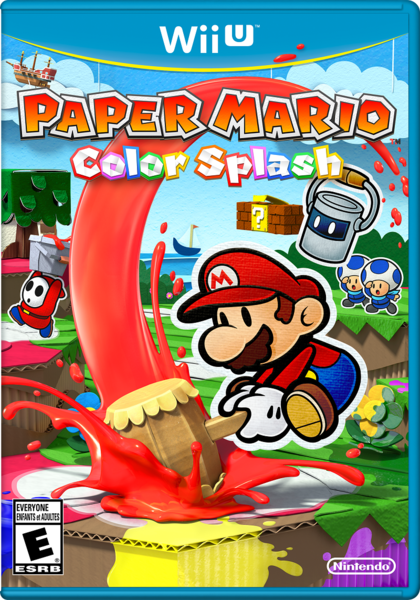 Either way, these are the reasons Paper Mario Color Splash might not be so bad. Does it trail away from the older Paper Mario games? Yes. Does it look like another Sticker Star? Yes. Will it be as bad as Sticker Star, though? That’s debatable. This game, while looking like Sticker Star at first, is starting to shape up a little bit differently than Sticker Star, and that could be a good thing. The reason Sticker Star failed horribly was because Nintendo didn’t tell us about these changes. They just happened and no one expected it to be as bad as it was. This time can be different. We know it’s no longer an rpg. We know what to expect a little bit more this time. Hopefully I’ve been able to get someone to understand the other side of the spectrum and maybe I’ve convinced some people to try the game when it comes out. I also made a video, if you’re interesting in checking that out! Okay, I've just fixed the formatting. Not sure why it's coming up with the wrong member name, I'll look into that as well. But now it's all laid out well and the videos are now working as expected. [QUOTE="CM30, post: 142131, member: 1"]Okay, I've just fixed the formatting. Thanks. I appreciate that. I wasn't sure why it was formatting weirdly. Also, yeah, that member thing has been a problem for a while now. It says I'm Dark Young Link on the forums, but on the site itself it says I'm Link70222. Seems like XenWord is having trouble syncing the accounts properly. Not sure why to be honest.